Our Denbigh shutters experts appreciate that your home is your castle, and as a result you want the most stunning interiors to match. The historic town of Denbigh, close to the Clwydian Hills, truly boasts many beautiful homes. Whether you live in a sprawling country home on the outskirts, or a chic apartment in the town centre, shutters make for the perfect addition to your interiors. Get in touch with our North Wales division to discuss our Denbigh shutters! Our Denbigh shutters experts Ken and Angela are passionate about providing the finest quality plantation shutters. Get in touch by calling 01352 872058 or alternatively use the buttons below. What are the benefits of Shutters? Our Denbigh shutters boast a wide array of benefits. 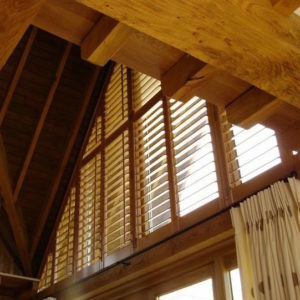 Naturally, shutters are simply stunning additions to any home – however shutters are also incredibly practical. Furthermore, we are so confident in the benefits of our shutters that we offer a lifetime guarantee. Shutters are seen as a luxury good. It is not hard to see why as a result of them being a constant fixture in glossy interior design magazine and chic hotels. However, shutters may not be as expensive as you may think. Click here to use our online calculator. Furthermore, shutters are incredibly good value for more. This is as a result of their durability and longevity – not to mention the potential value they can add to your home! At Just Shutters, we put customer satisfaction at the forefront of everything we do. Therefore, we are incredibly proud of the 9.9/10 rating we have been awarded on Checkatrade. This impressive rating comes as a result of over 1700 independent reviews from our valued customers. Visit our profile or read below for examples of their feedback.